Police shut down the intersection while they investigated. Photo by Stephen Carr. Two bicyclists: a 64-year-old woman and, just today—Wednesday—an unidentified male. Two pedestrians: 79-year-old Elias Sanchez of Long Beach and a 58-year-old female resident of Carson. One motorcyclist: 25-year-old Corey Haggerty. One automobile driver: a 36-year-old resident of Long Beach. 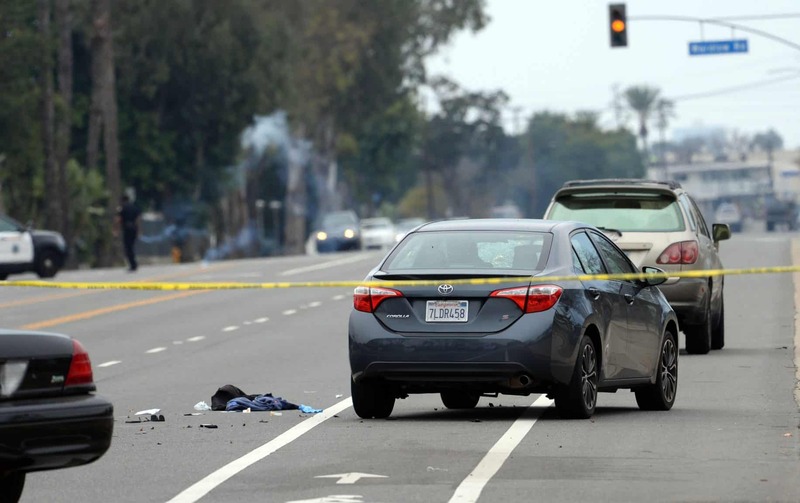 These are the six people killed by cars in the first 30 days of 2019 in Long Beach. But I did receive a very odd email on Tuesday night after I published a commentary calling for the city to move forward on regulating e-scooters in order to garner funds to fix sidewalks, repair roads, and create more green spaces. You have not included anything about the accident rate of scooters. Lawsuits brought on by people injured by those who were hit, etc. Seems like journalism no longer cares to give the whole story, only slanted stories that benefit their views. What was odd was not the message itself being sent. (This is actually one of the calmer messages from one of my trolls; I’m just happy they weren’t threatening to kill me. Again.) What was odd was the realization that the counterpart to that message has never been sent to me. 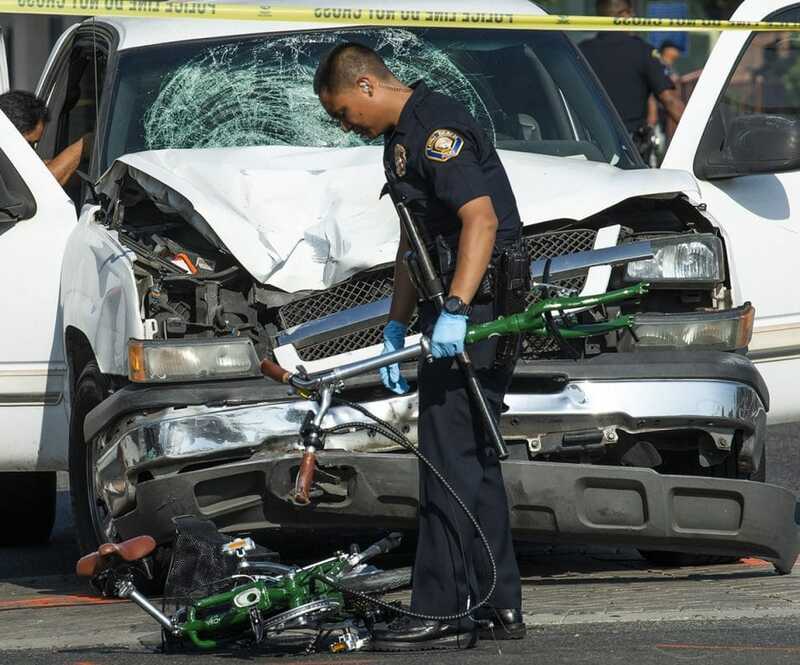 A Long Beach police officer picks up of whats left of a bike after bicyclist Ben Rael was killed in a crash with a pickup truck at Seventh Street and Martin Luther King Jr. Avenue Thursday morning in Long Beach August 2, 2018. Photo by Thomas R Cordova. I have never, in the decade-plus of my career, received anything that expresses the same sentiment about cars. I’ve never received a message that complained I didn’t talk about a driver who controlled a car that killed someone; no, it was always this magical vehicle jumped the sidewalk all on its own and took the life of a pedestrian; everyone seeming very comfortable with the myth that car crashes are “accidents” rather than preventable events. Yet, I receive, over and over from car drivers, angry, unsubstantiated bowls of crazy which argue that only individual cars driving for free on roads are meant to be a part of society. E-scooters are injuring people! Ban them. Bikes are riding on the sidewalk! Ban them. Death, disaster and destruction yielded by two-ton metal chariots that travel at high speeds with the tap of a foot? WHERE DO I GET ONE AND GET OUT OF MY WAY. 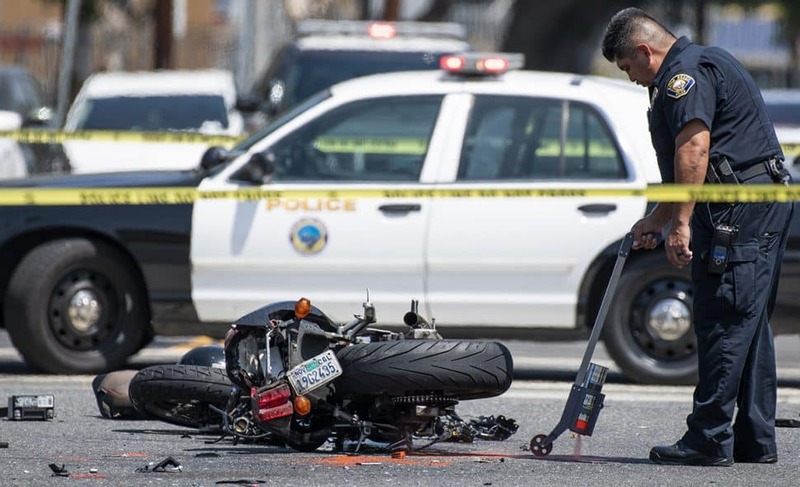 A motorcycle and an SUV collided at 28th Street Pacific Avenue in Long Beach August 21, 2018. The motorcycle rider was transported to a local hospital. Photo by Thomas R Cordova. So while there are residents like Linda Spery calling for the ban of e-scooters because they “break the law” when they ride on sidewalks you rarely hear anyone calling out car drivers who are “breaking the law” every moment of every day. 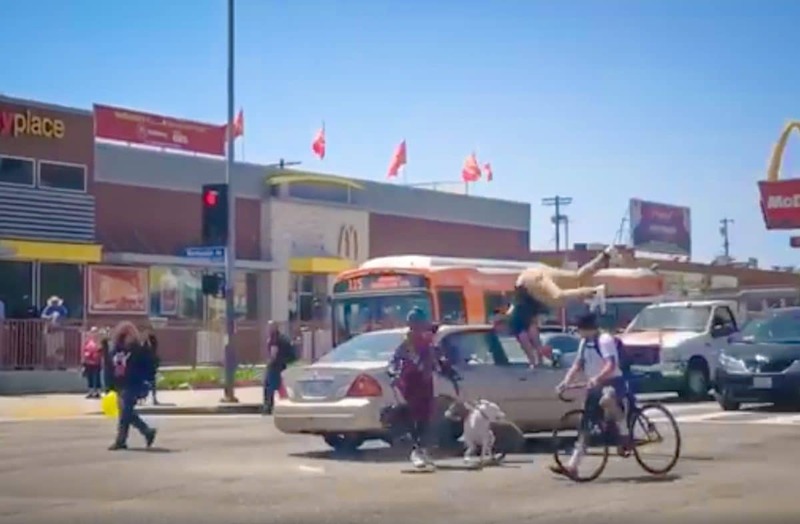 The ultimate issue is this: As our streets become more crowded, we have a responsibility to protect those who are most vulnerable, including the elderly, the less affluent, the bicyclist, skateboarder and pedestrian. This, in turn, means that those who operate vehicles—the most lethal thing on the street; there’s nothing remotely even close to their level of destruction—should be expected to act the most responsible. And yet, we continue to dismiss the role drivers and their cars play in causing death and, instead, often blame the victims themselves, telling everyday pedestrians that they should coat themselves in full body armor before stepping outside. We are in this together and we are all responsible for behaving safely, so let’s shift the concentration of safety efforts away from pedestrian shaming, away from getting angry at buses and trains and bikes and e-scooters, and focus on the matter at hand: safer streets. But in order to focus on that, we have to have a discussion about reexamining our streets and reexamining the many myths we create in our heads as drivers, including the one that driving a car is our right rather than a responsibility and privilege. It means talking about how to decrease speed limits, about how our impatience causes deaths and injuries. It means talking about how we create complete streets, not raceways or more drive-thrus. On April 10, 2018, a driver crashes a vehicle into a group of bicyclists mourning the death of a 22-year-old cyclist, hit by a driver who fled the scene the day before. Courtesy of KTLA. It means talking to the family of Ben Rael, the 35-year-old bicyclist killed on Seventh St., last year, to let them know that his death was preventable and we are choosing each day not to ignore that. It means telling the family of 22-year-old Frederick “Woon” Frazier, killed in a horrifying hit and run caught on video, that we are working to prevent another loss like his from happening again. It means recognizing that adding a few more minutes to your commute or creating a new bike lane or widening a sidewalk or creating a longer crosswalk signal is worth a human life.